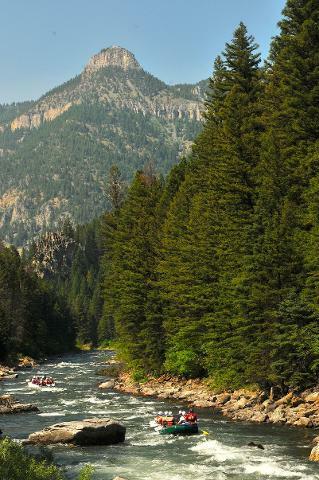 Whether you just can't get enough of the guides humor or you're just hoping for the best day on the river, the Full Day Rafting Trip is your adventure. Nothing beats pushing off into the river on a clear sunny morning, in anticipation of the days fun to be had. The morning starts out with relatively calm waters. Enjoy the sounds of nature and maybe an occasional wildlife sighting. We try to stay dry and comfortable for a bit but that comes to an end as we navigate some of the morning's rapids like Portal Creek and Sheepeater. There will be time to use a restroom before we continue, and then we'll gear up for the afternoon's thrills. Rapids like Screaming Left, Hilarity Hole and the infamous Mad Mile await. If you aren't wet enough by the end, we can always stop off at one of our favorite swimming holes before the end of the trip.